There are many different kinds of users of Concentration - the Memory Games. Some of you play concentration for the thrills: racing against the clock, trying to break your old high score. And there are others who just want to Play, with a capital P, not interested in timers and scores, but bothered by anything that distracts them. Some of these players suggested some modifications, I hope these minor changes will make hundreds happier. In single player games there's no timing and no score is calculated. Since there's no score the results are not added to your personal statistics. In dual player modes there's no scoring. In single player mode at the end of the game the winning sound is played, no matter what. There's no winner announced in dual player modes. When playing against a computer opponent the winning sound is played at the end of the game, no matter what. When playing against a human opponent no sound is played at the end of the game. The status bar displays player information, but show N/A instead of time and score. If you don't want to see this info, in 5.0 you can hide the entire status bar as well. On the screen shot you see the Assorted Sounds sound card set. There's a drawback, however. Since there's no scoring, no results are saved to the statistics, no high scores are made. To make sure this doesn't cause any disappointment, a new waring has been introduced. Whenever a stress-free game starts this waring is displayed. Of course, you can disable any warnings and reminders in the game. Some of you just asked if there was a way to disable losing sound, which can be annoying. Well, now there is, you can configure sound options and replace the sound that's played when you don't break a high score. Of course, in this case scores and statistics are kept this is just a sound preference not affecting other game features. 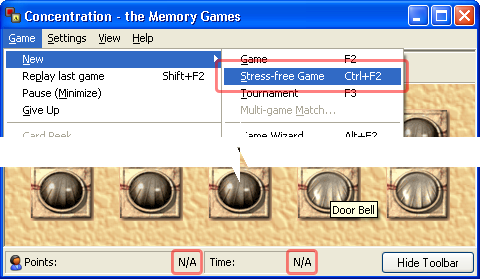 In the first release of Concentration - the Memory Games the game window had a fixed size. 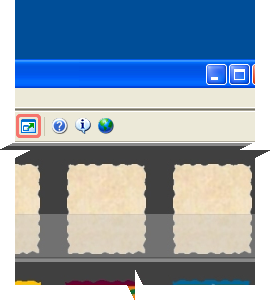 With version 3.0 the window properties were changed to allow the maximized game window to cover the desktop. 5.0 introduces a full-screen mode and some related enhancements. Full-screen mode is an option in many windowed applications, probably your word processor or browser applications have it, too. Just press the F11 key and check it out. From the next release you can play Concentration - the Memory Games on full-screen as well. You have more space to play, you have less visual elements to distract you. You can definitely focus on the game. Take a look at the next demo screen shot (click both images to enlarge). 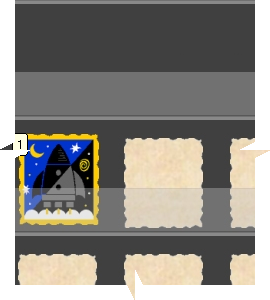 We used our first animated card set, Travel Stamps, to demo this feature. In previous versions you had an option to hide the toolbar. In version 5.0 you can hide the status bar as well (both from the new View menu or the Options / Preferences / View option page). In this moment neither Concentration - the Memory Games 5.0 nor the Travel Stamps animated card set is available. That's why this post is categorized under Feature Preview.